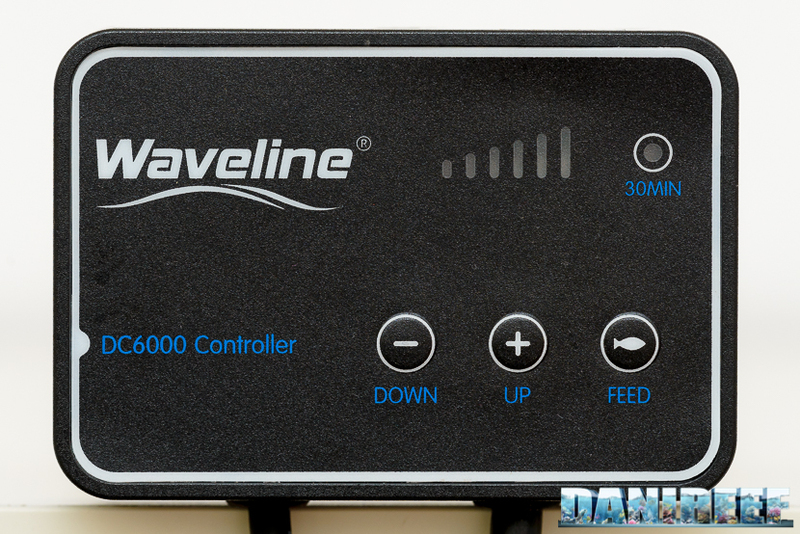 This is the new Waveline DC6000. 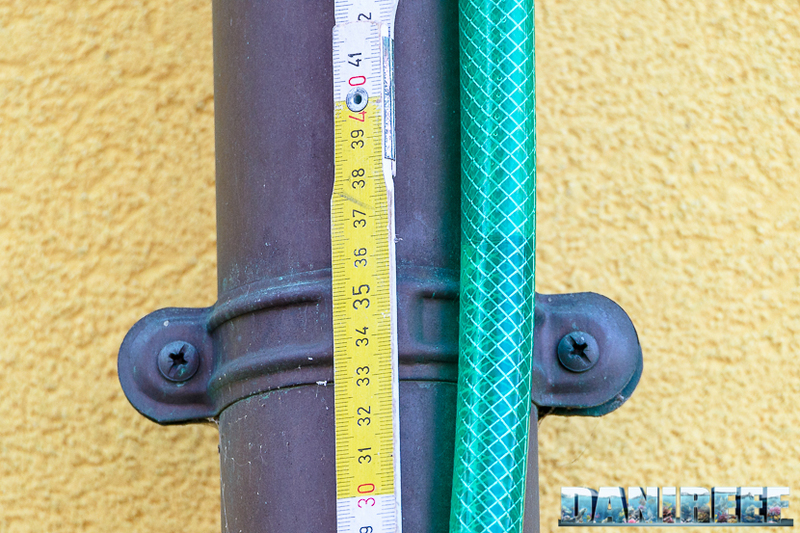 For this review, we measured hydraulic head, flow rate, consumption, and cos(fi). 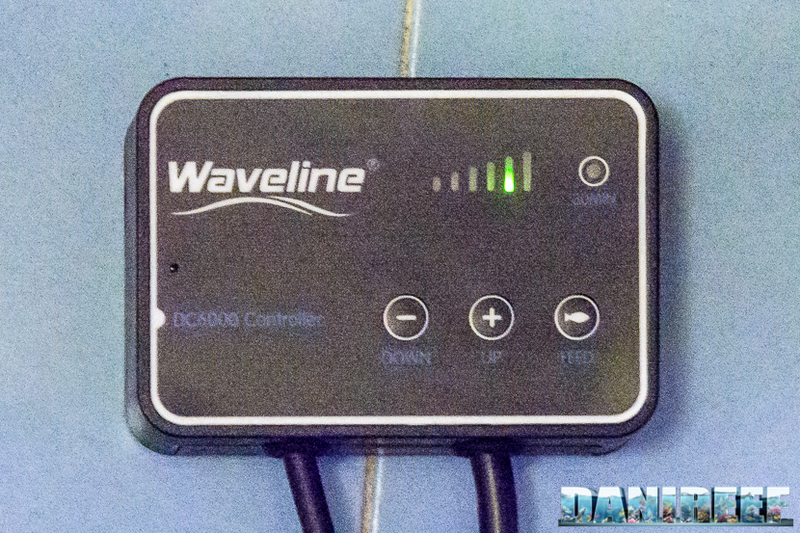 In addition, the Waveline DC6000 is an electric pump with a dedicated digital controller, so we were able to measure all the values for each incremental step. 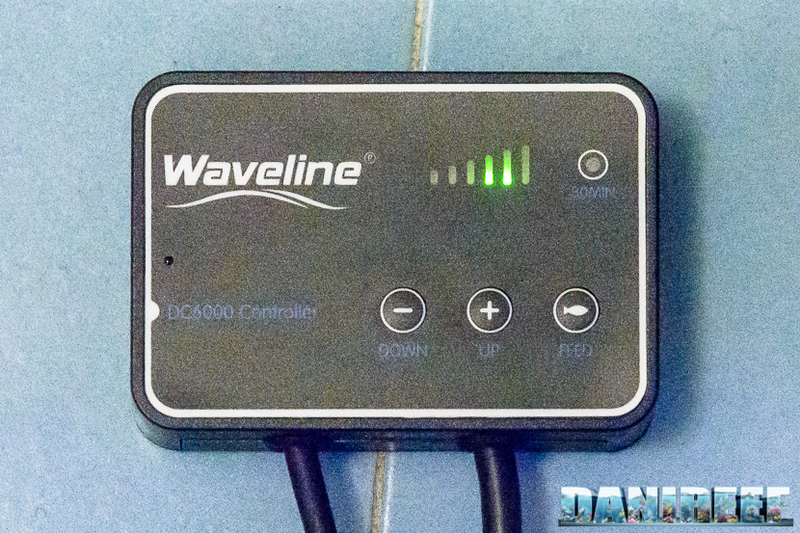 The Waveline DC6000 is advertised as having 4.4 metres of hydraulic head, so we used the usual static method to measure it; for the flow rate we used a flow meter, the DigiFlow 6710M, and for the consumption a new instrument, the RCE PM600. 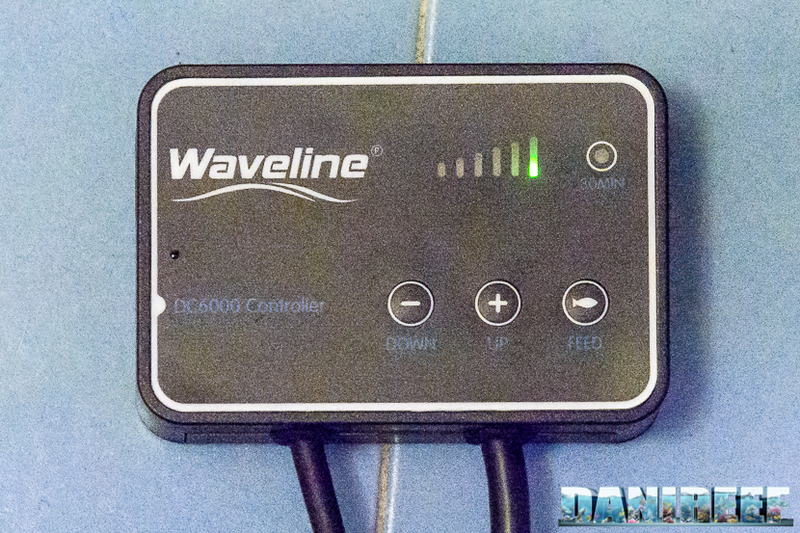 What impresses in the Waveline DC6000 is the quality of the plastics, their refinements and the declared technical data. 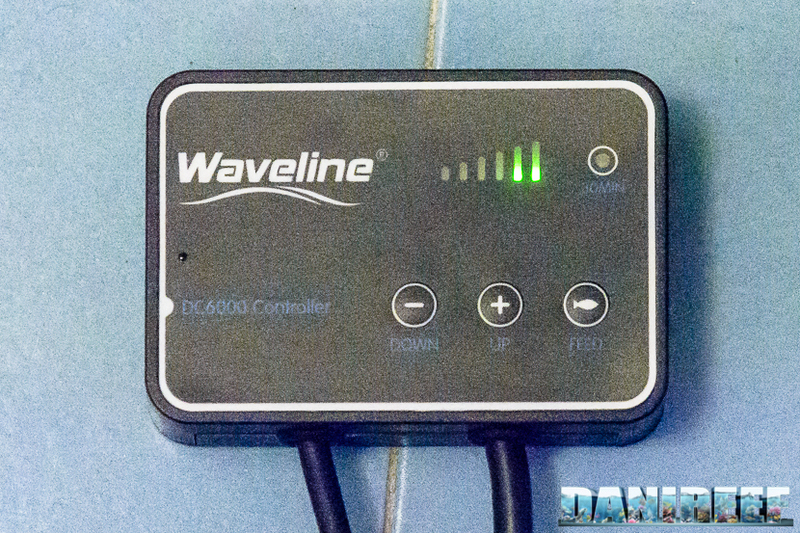 It costs 283 euro ($316 US), a reasonable price for such a high-quality piece of equipment. 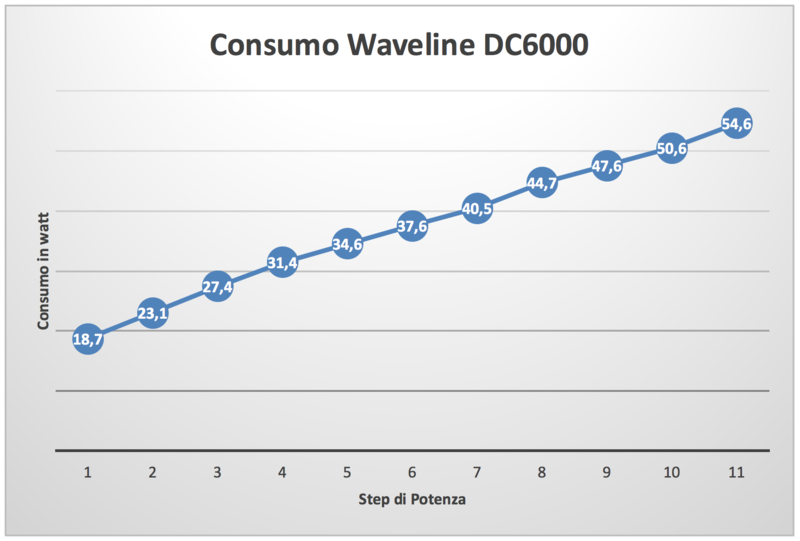 The DC6000 has a energy efficiency of 109 liters for each watt, an economic efficiency of 21,2 l/s per euro, a reference value of 26.400 l*m/h. 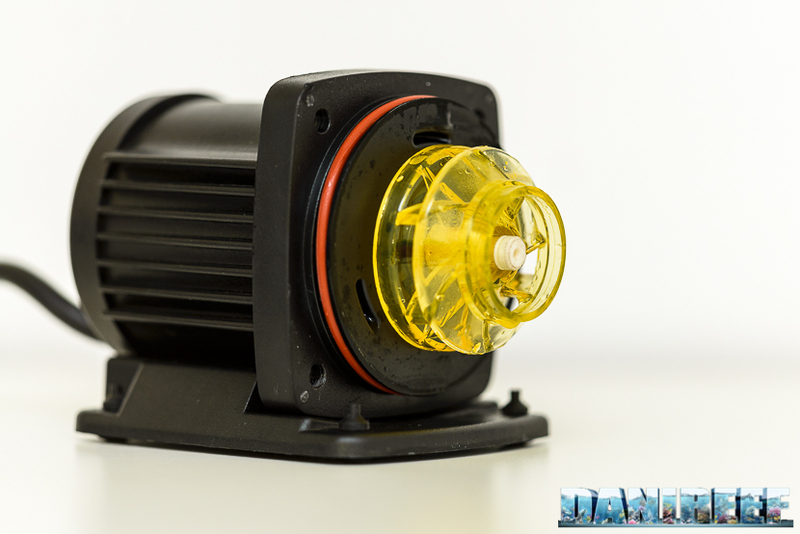 So, for 283 euro, we can bring home a modern and electric pump, very well made, piloted by an external remote control, with optimal performance and technical efficiency. 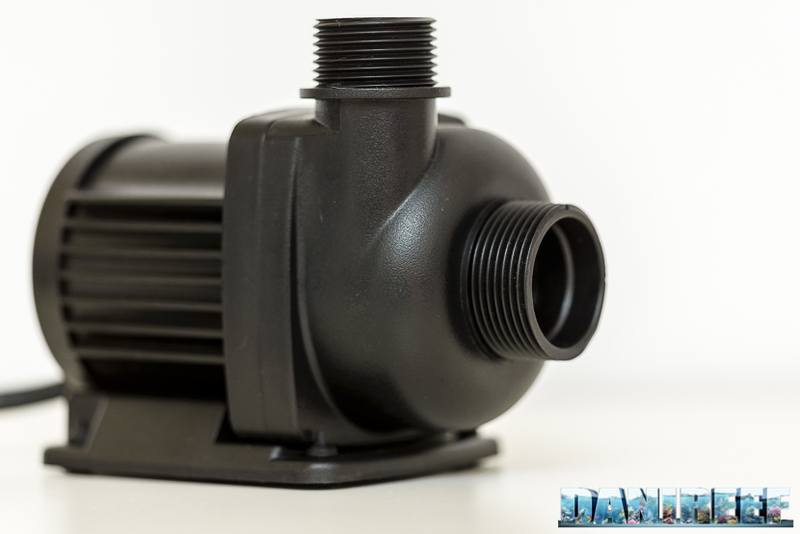 The pump is beautiful as you can see: simple, linear and circular. We liked its construction very much. 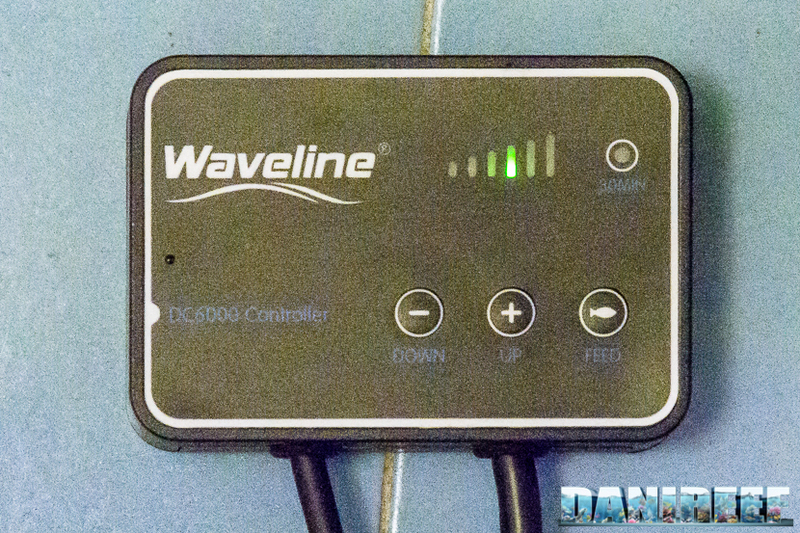 Inside the box, with the protective panels, there’s the pump with the transformer, the cables, and a small handbook with the use and maintenance instructions. 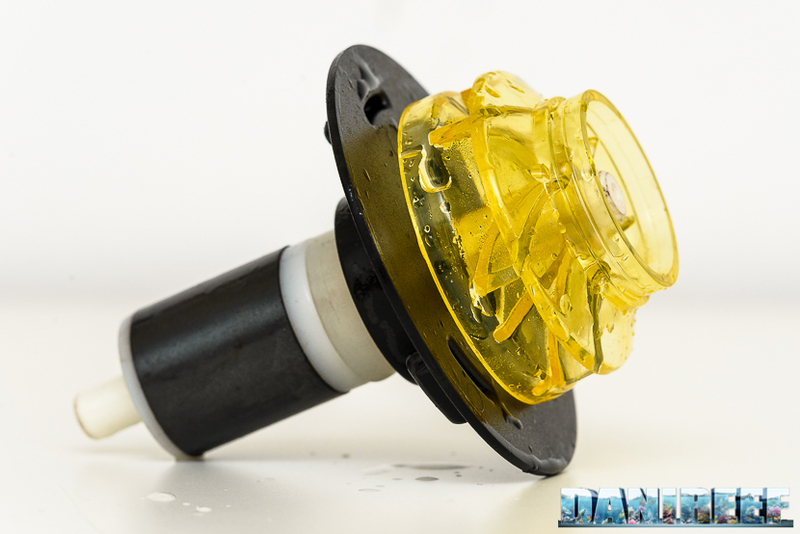 We have taken apart the pump to see its core, as usual. 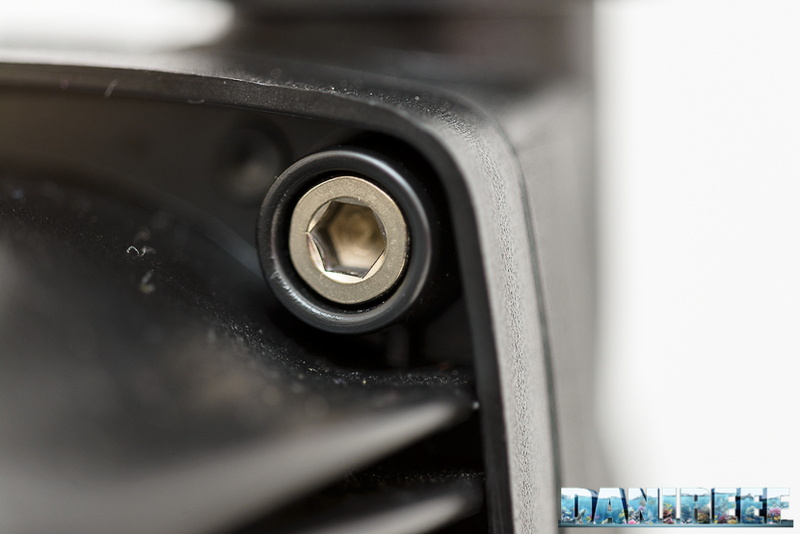 It’s very well built even under the skull cap protecting the rotor. 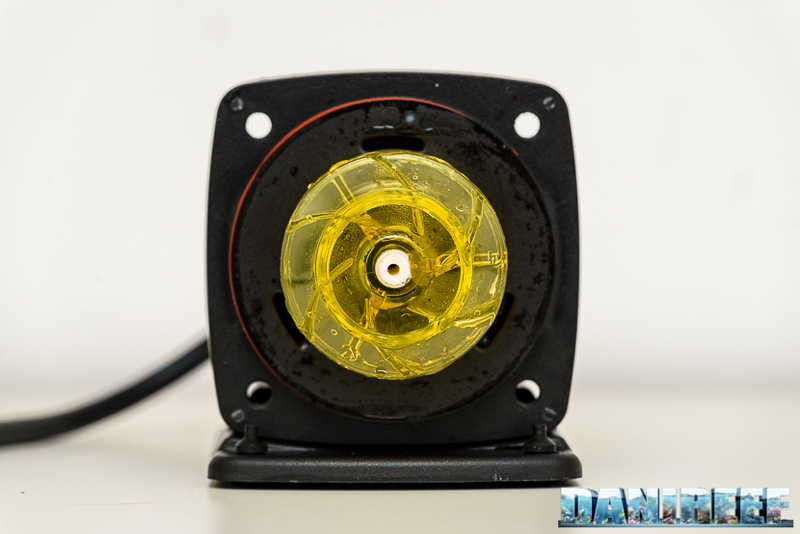 The rotor is built with yellow plastic, very different from the usual. The rotor is very impressive. 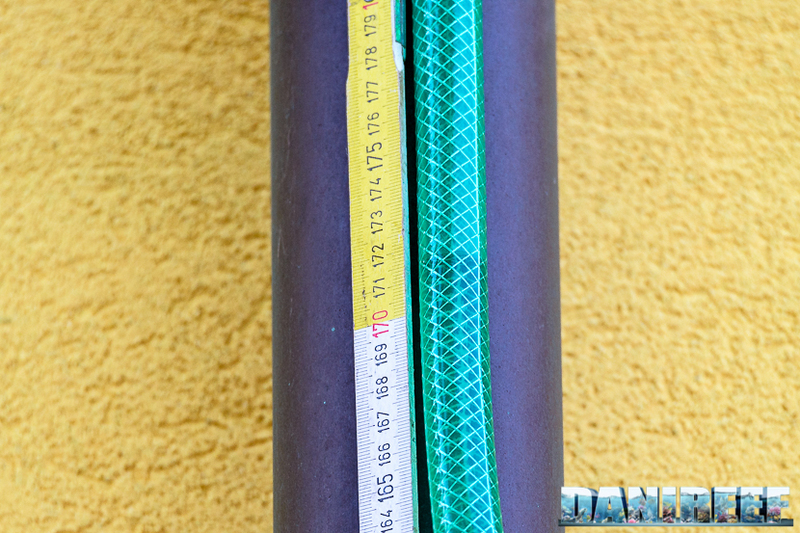 The magnet is big, and the pales suggest an extremely silent work. 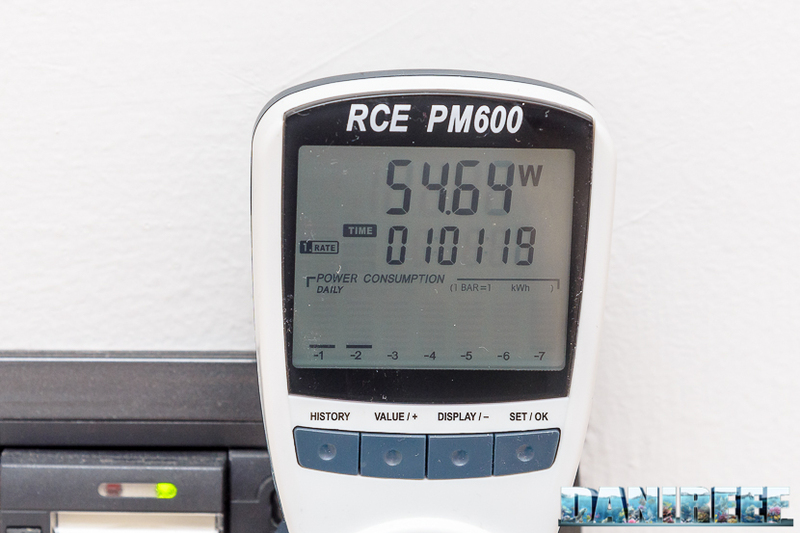 As you can see above, the controller is extremely simple: the two buttons “+” and “-” (or named “Up” and “Down“) adjust the power according to 11 scales of values. 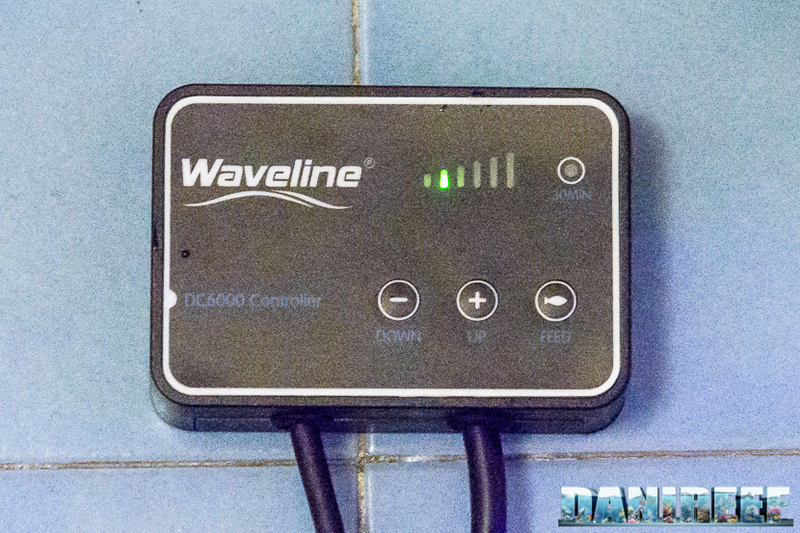 There’s another button, named “Feed“, which stops the pump for 30 minutes, for use when feeding the tank. 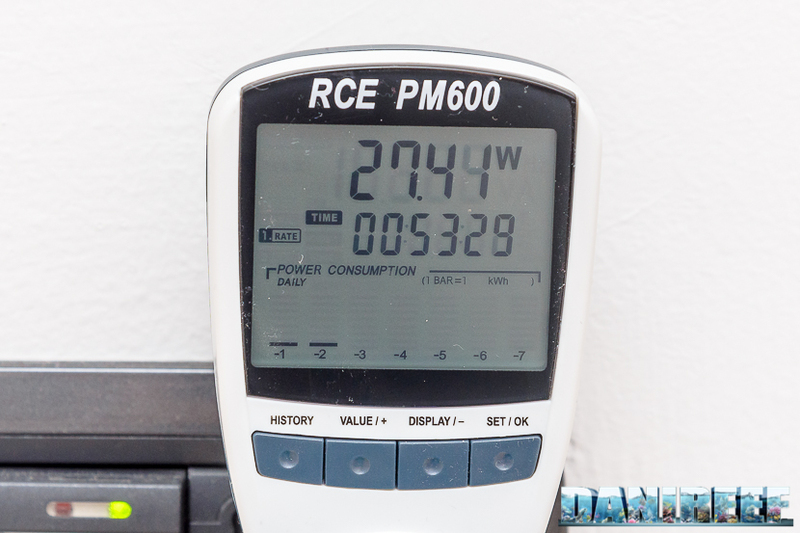 When in use, the controller switches on a green led in the graduated scale, as illustrated in the gallery above. 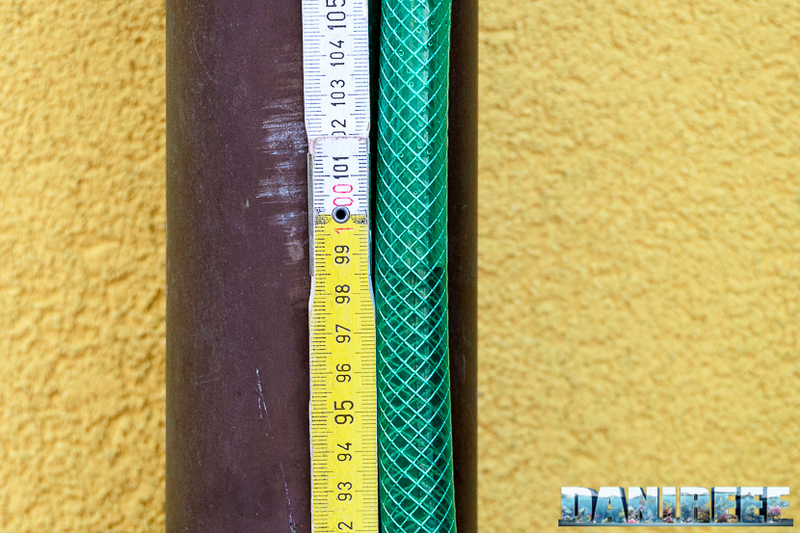 The first test we made was the hydraulic head measurement, which is the capacity of the pump to elevate the water to a certain height. 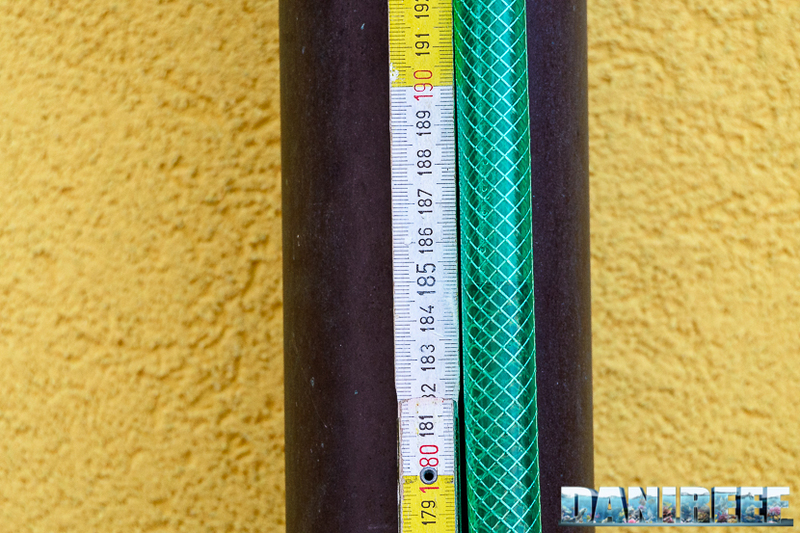 Usually the test is very easy, but this time it was a little more complex because the declared head was 4.4 meters (14.4 feet). 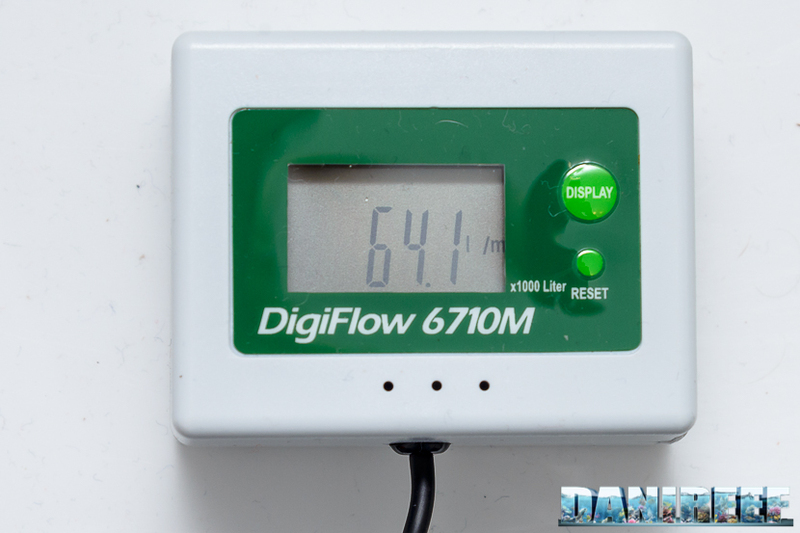 Moreover, we measured the hydraulic head at each power level, and the pump has 11 intermediate steps. Our method is always the same. 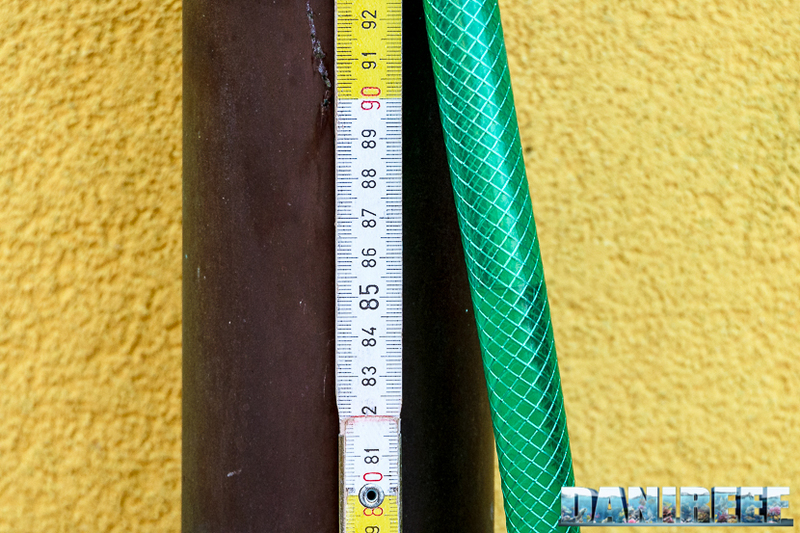 We submerged the pump in a bucket with a few centimeters of water then we connected the pump to a plastic gardening tube, kept vertically; we turned the pump on and then measured the height of the water column compared to the water in the bucket. 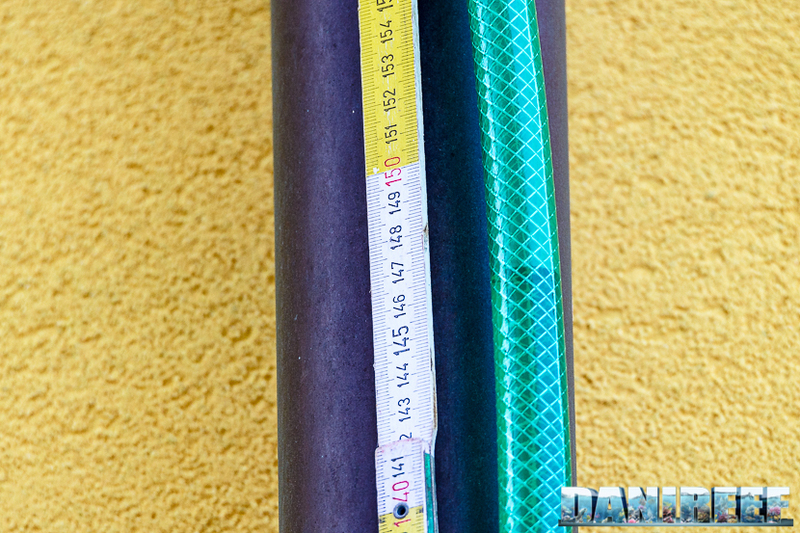 Here are all our results; consider that we have used a new tape every 2 meters. 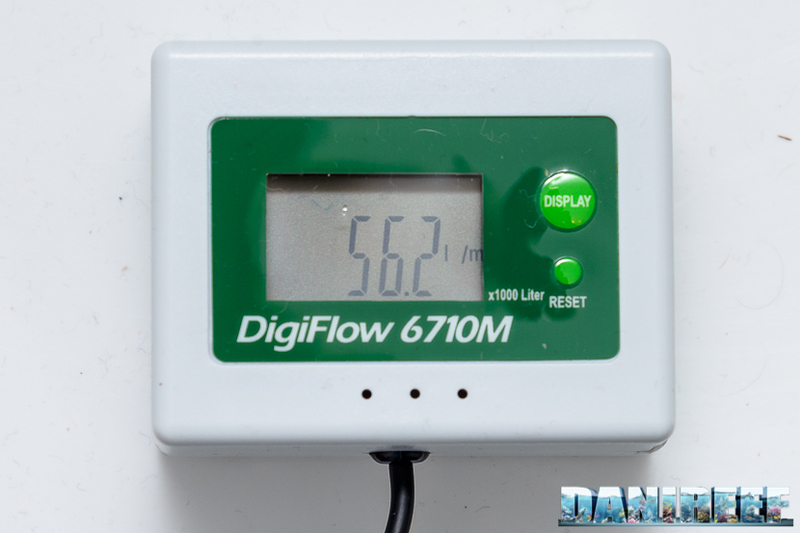 In the chart above, you can see our measurements – the hydraulic head increases steadily with each, and the values are well spaced, which means finding the right level for your aquarium should be quick and easy. 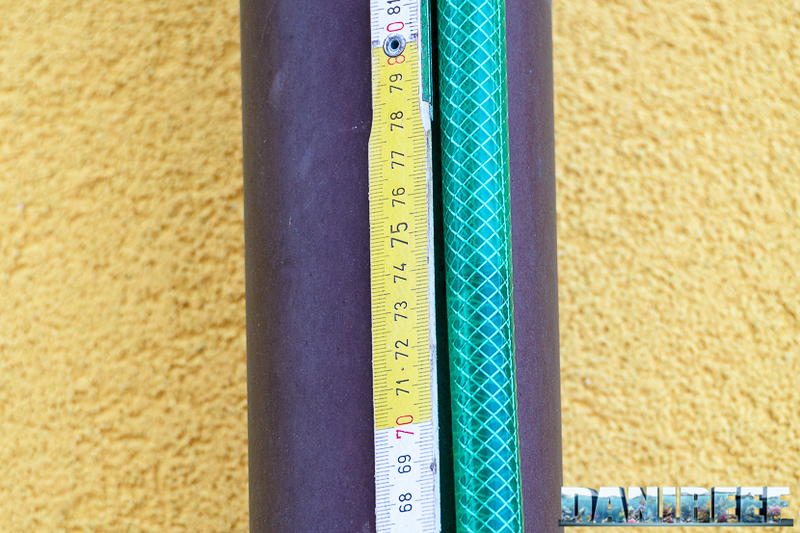 So the hydraulic head value measured is 392 cm, which is the read 192 plus the 200 cm of the previous tape. The declared head is 440 cm. The gap is 11%, acceptable. 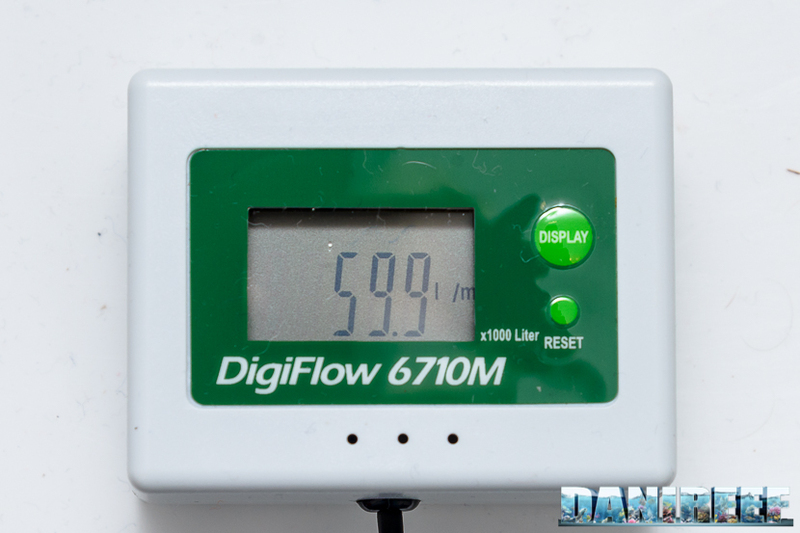 The characteristic curve is the relationship between the flow rate values and the various heads. 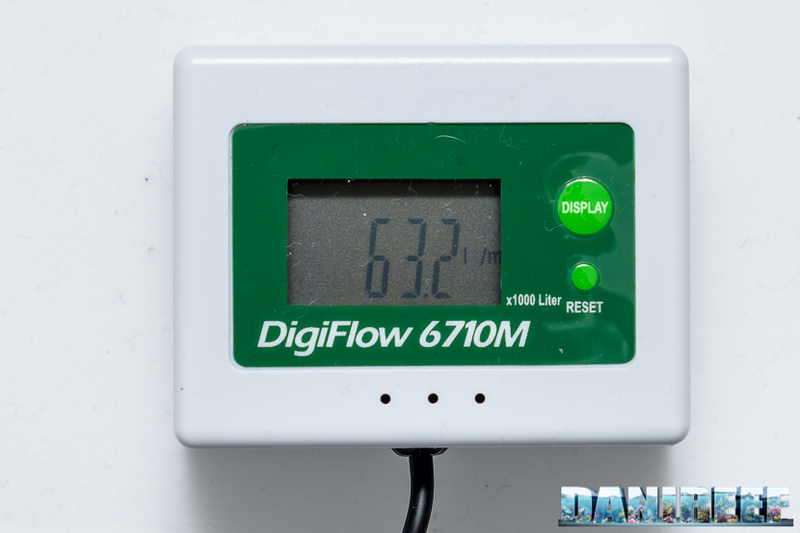 Without an appropriate instrumentation it’s impossible to measure it directly, so we just united the two extreme points of flow rate and head (at the step 1, the minimum of the pump, and at the step 11, the maximum). 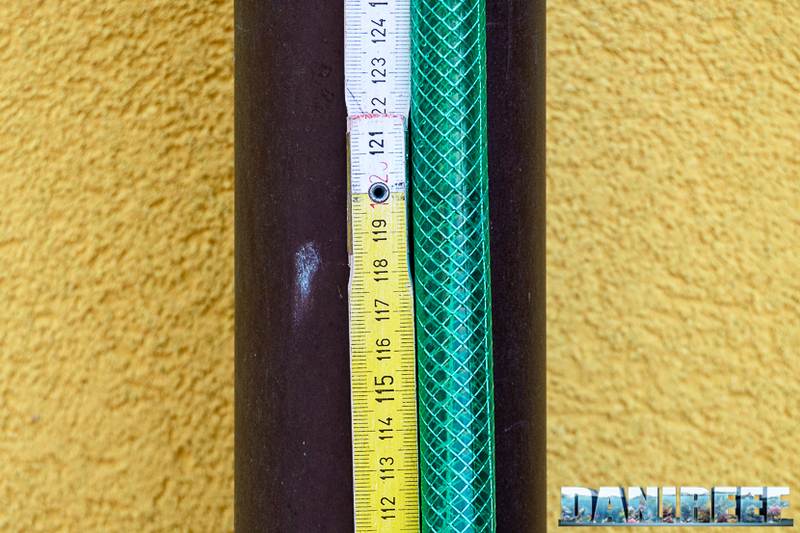 In theory if you choose the hydraulic head you need, for example 150 cm, you just have to trace a perpendicular line starting from that point, then see where it intersects the characteristic line and with which value it corresponds. 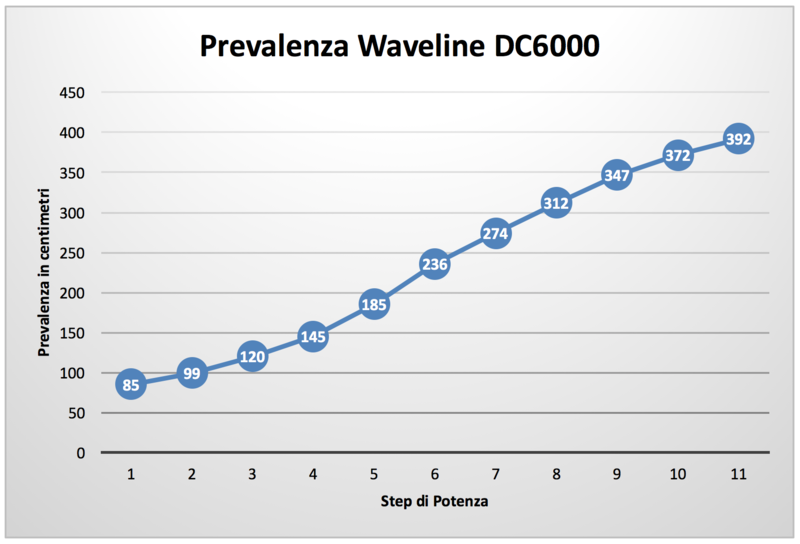 With the Waveline DC6000 at the 11th step we can have an estimated flow rate about 2.500 l/h with 150 cm of hydraulic head. 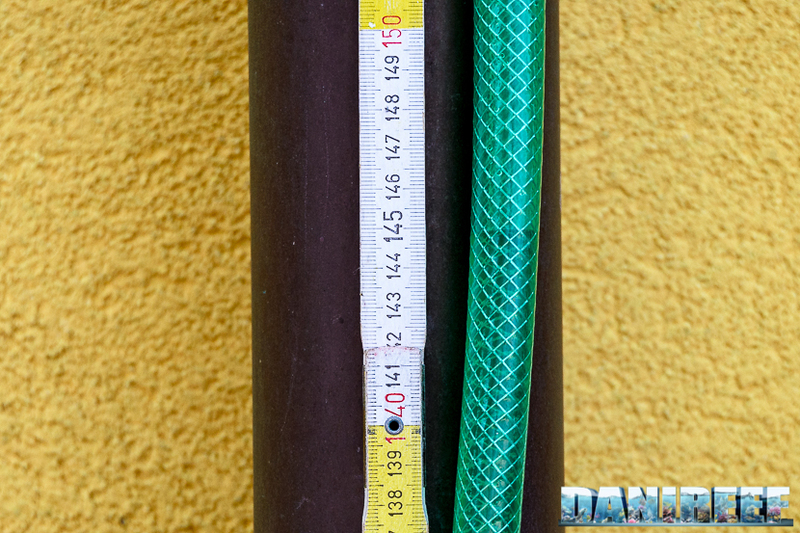 At step 1, the pump doesn’t reach 150 cm of head. 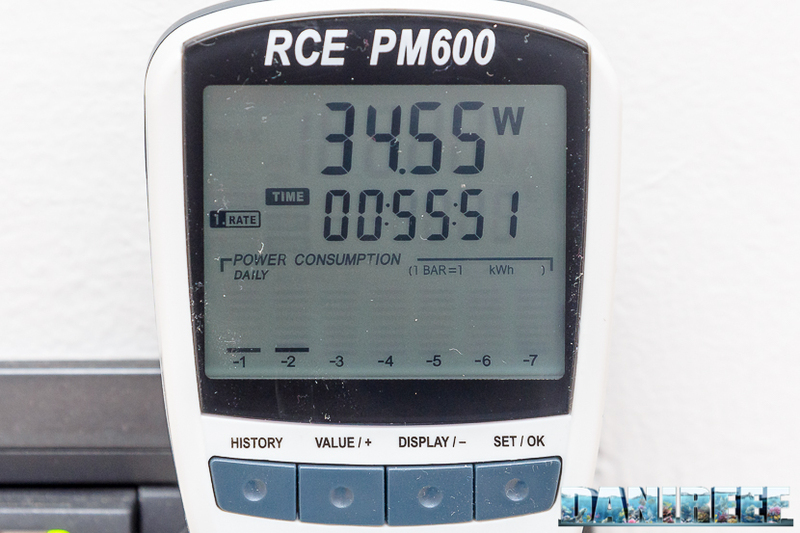 The measurement of the instant consumption was possible thanks to the RCE PM600 which is able to measure also the Cos(fi) (or power factor). 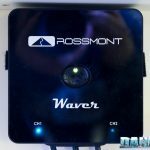 The result is directly given in watts. 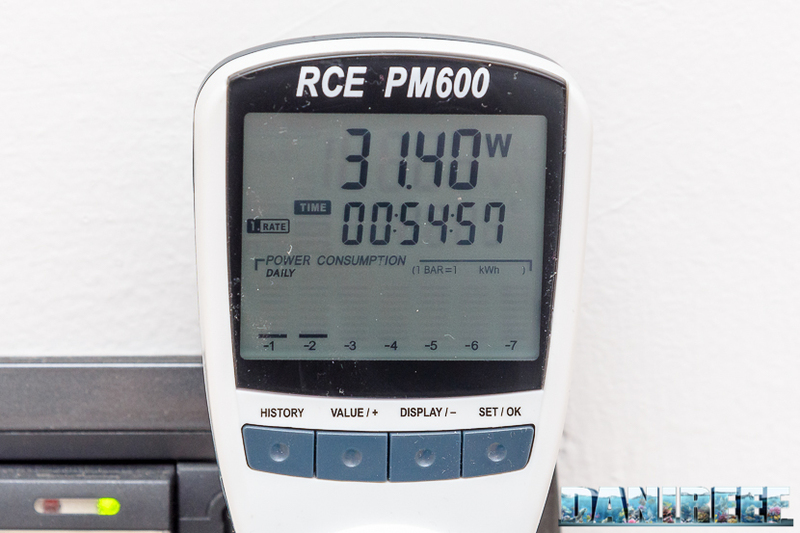 The energy consumption increases steadily with each step on the remote control: it starts with a minimum of 18.7 watt until a maximum of 54.6 watt. The maximum consumption declared by Waveline DC6000 is 55 watt, perfectly in line with our measurements. 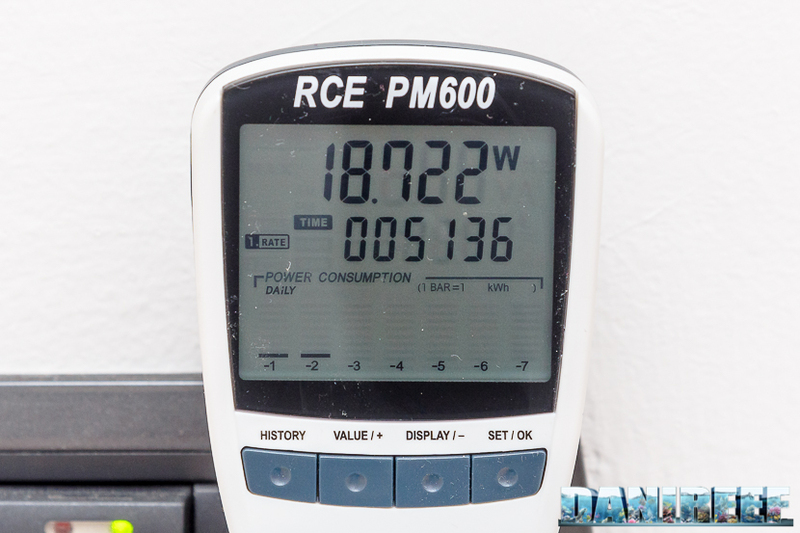 Thanks to the RCE PM600 we could also measure the cos(fi), which changes with each power step. 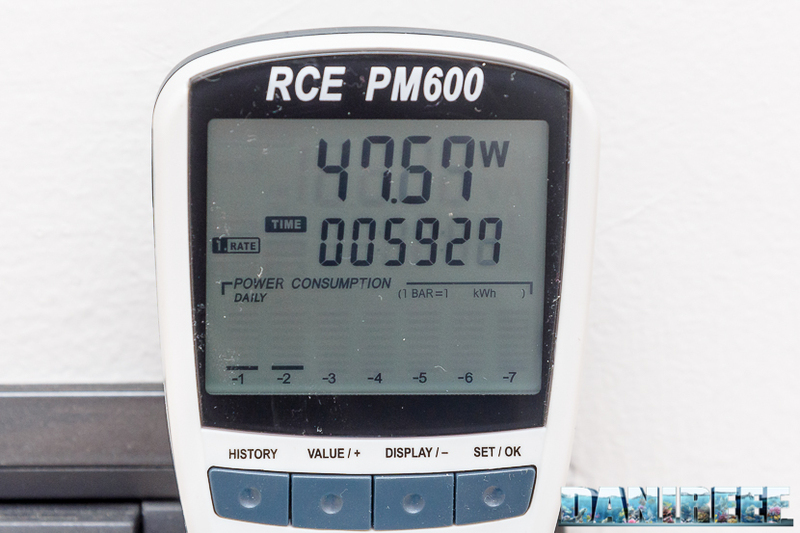 A minimum of 0.67 at 18.7 watt and a maximum of o.92 at 54.6 watt of consumption tells us that the magnet is probably neodymium, otherwise the cos(fi) would have been much lower. 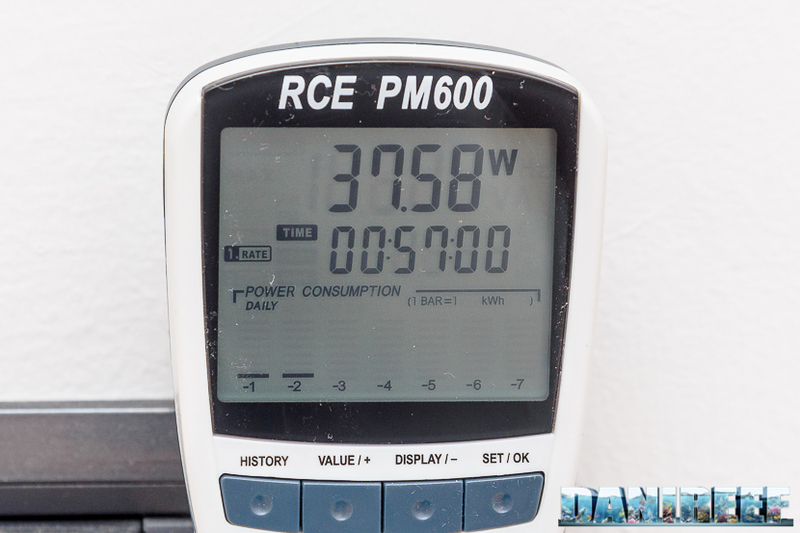 So at the maximum power, we have the 92% of active current, that is 50.3 watt, what we pay in the bill. 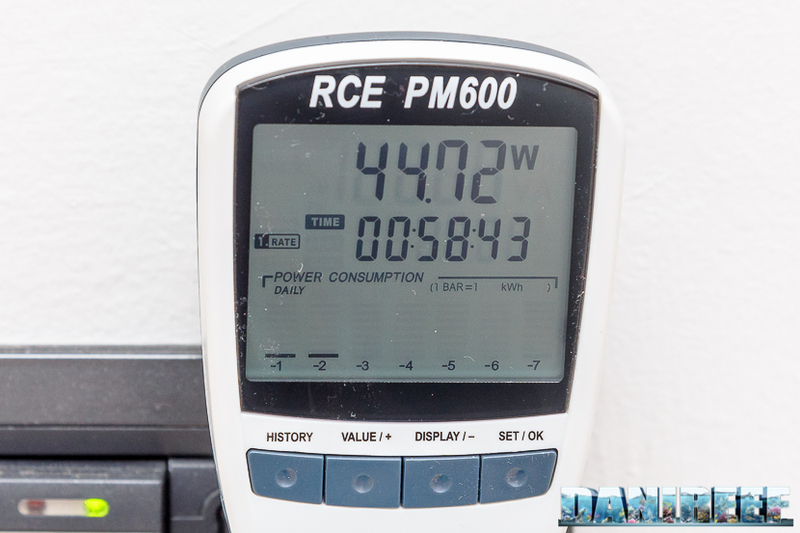 The apparent current part, in this case 4.3 watt (that is 54.6 – 50.3 watt), is not considered in the home’s electric counter, so we aren’t going to pay more for a sort of thing that happens to all the pumps. 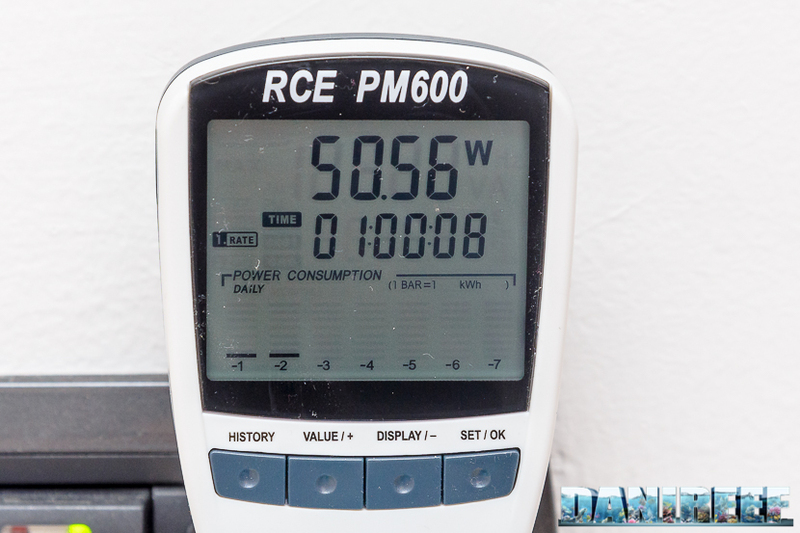 Considering a consumption of 50.3 watt and a energy cost of 0.27 euro per kwh, in Italy in this moment, we could use this pump continuously for a whole year with a consumption of 441 kwh, with a cost of 119 euro a year, or 9.9 euro ($11 USD) in a month. 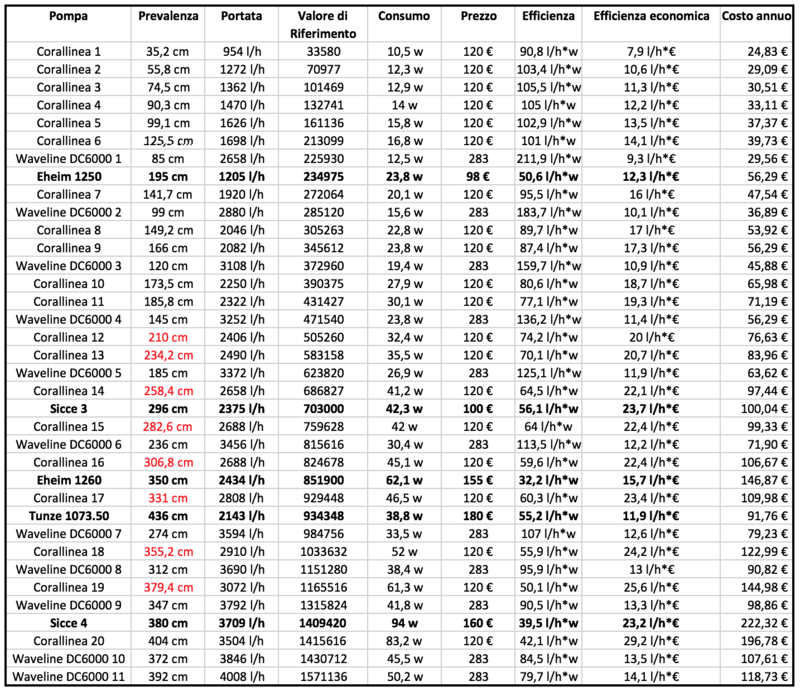 Here is the final, real consumption of the pump, corrected with the cos(fi) value as read from the instrument. 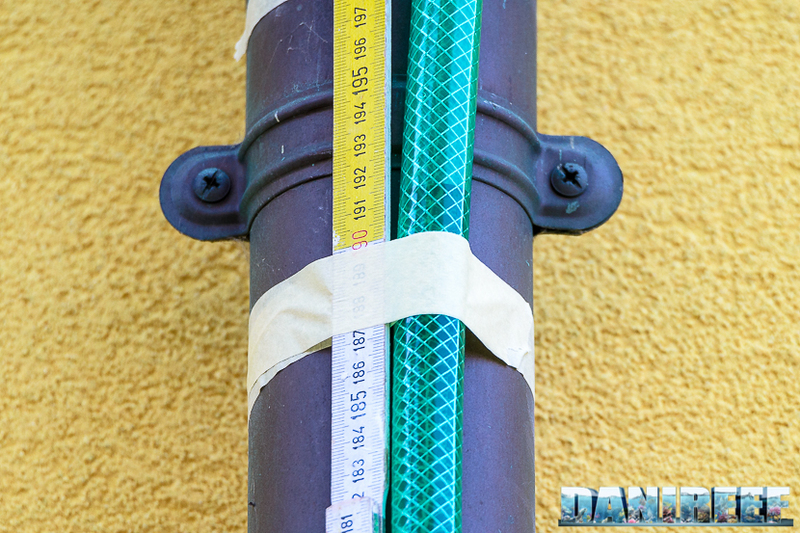 Because of the pump dimensions and the lack of an appropriate space, we couldn’t do our usual noise test. We can only say that the pump was nearly silent. 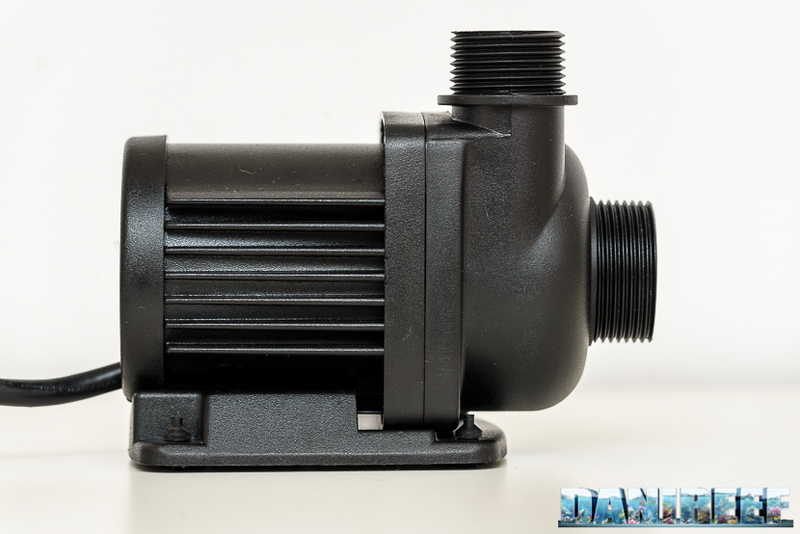 The regulable electric pump is one of the most beautiful things that we can have in sump, for a lot of reasons. 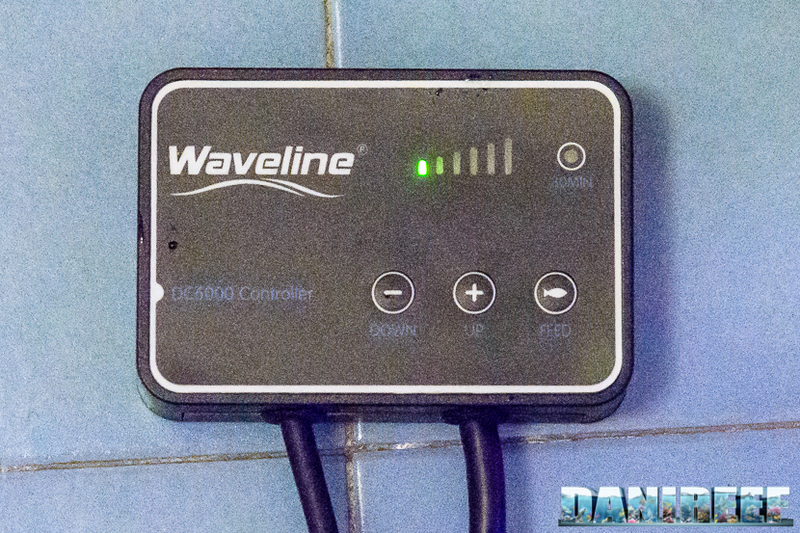 It’s priceless to be able to easily change the power for better adapting to your own aquarium. 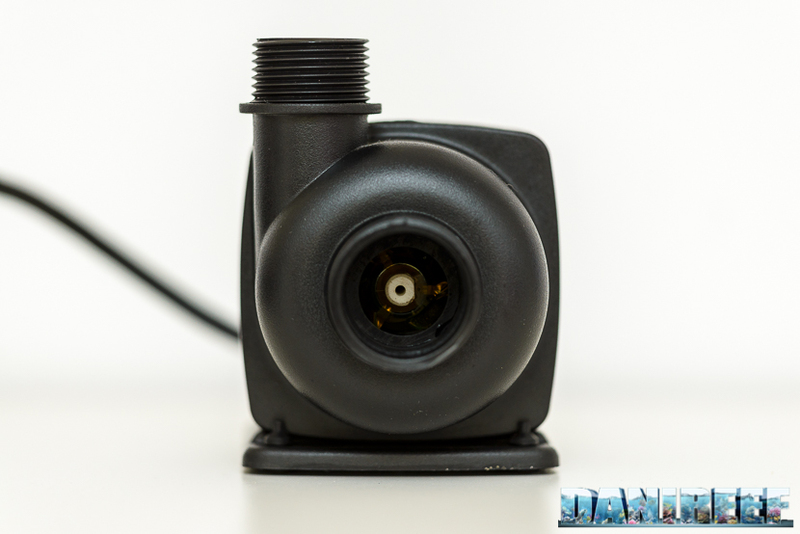 For example, when you have to change the water you can decrease the power of the pump in order to have less exchange aquarium-sump: in this way is not necessary to switch off the return pump. In fact, when lowering the range of the return pump, the water level in the sump tends to rise while, in the aquarium, it decreases. 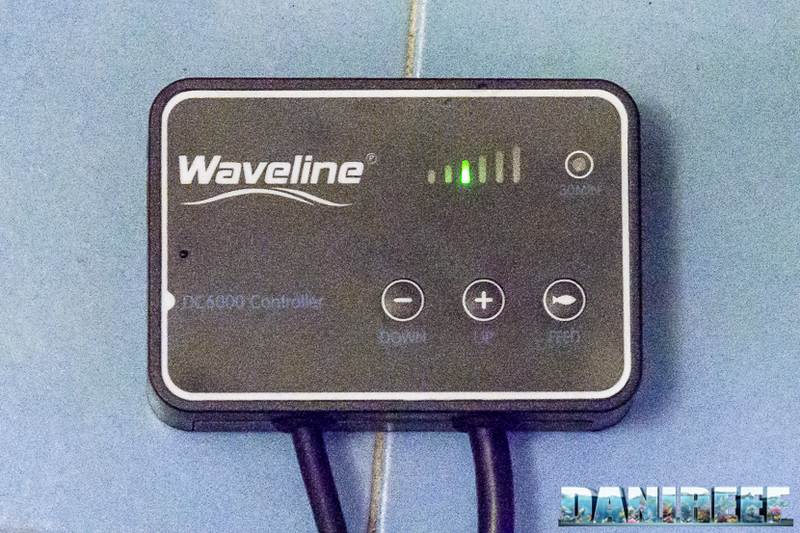 There is no risk of leaving the pumps without water, taking it away from the aquarium. 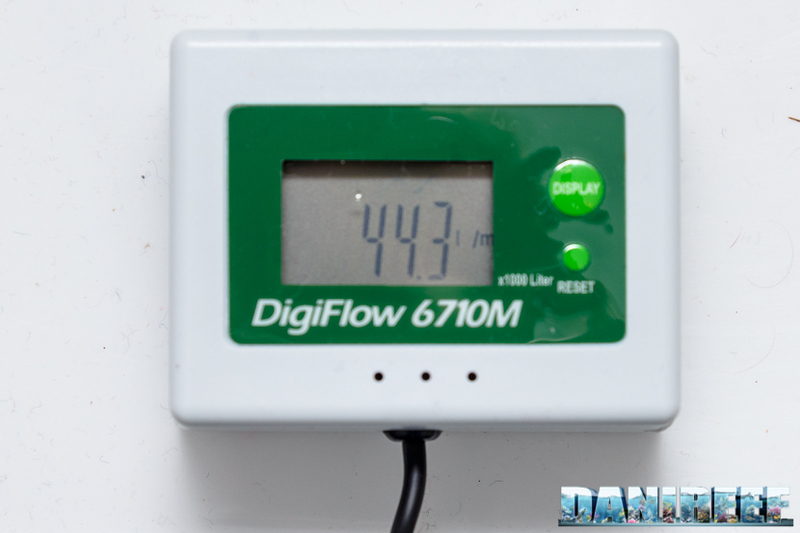 Moreover, from the point of view of security, it’s better to have a pump with 24V than 220V. 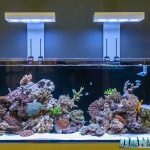 We hope that this trend will eventually be extended to all aquarium pumps. 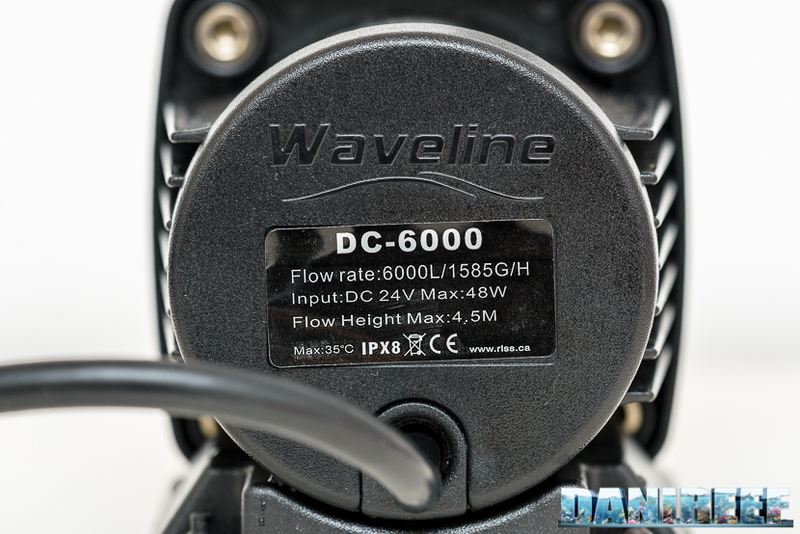 Right now, the costs are generally higher for pumps with a low voltage, and the Waveline DC6000 can’t be defined as a economical pump. But considering its performances, we consider the cost to be reasonable. 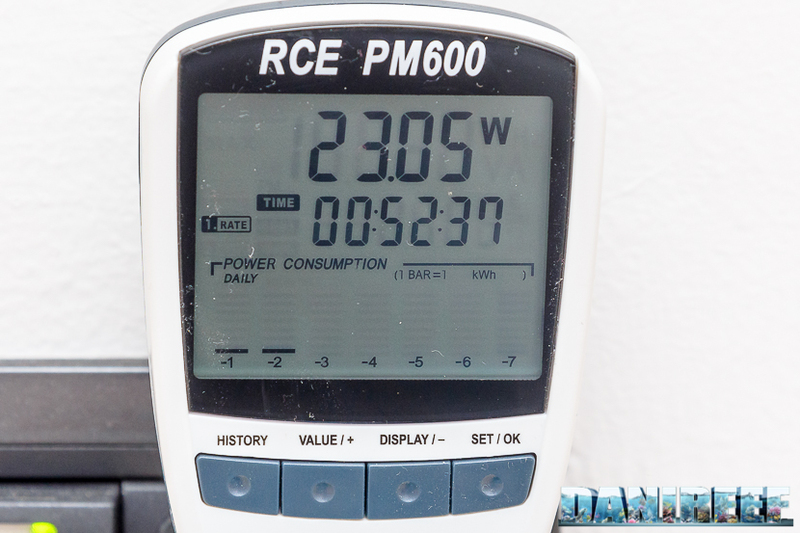 We now want to compare the pump with other pumps we’ve tested. 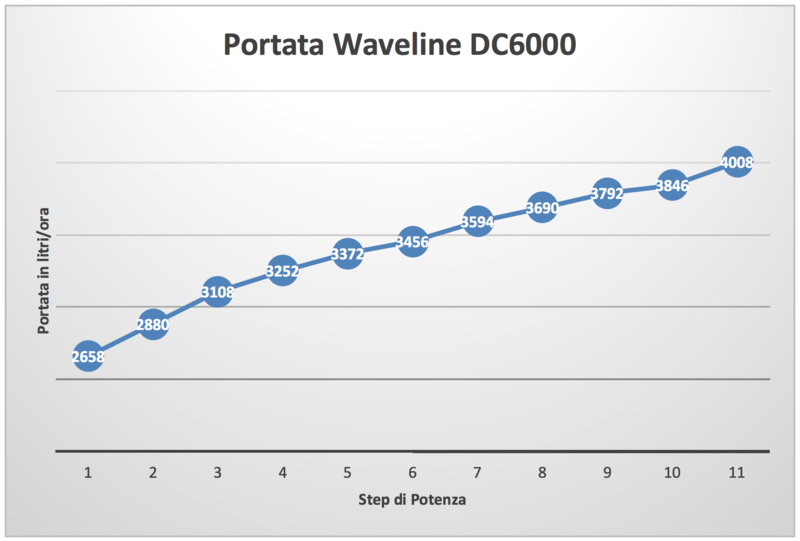 First, here’s the final chart with all the performances of the pump in the different power steps. These are reported hydraulic head, flow rate, consumption, energy efficiency and economic efficiency. 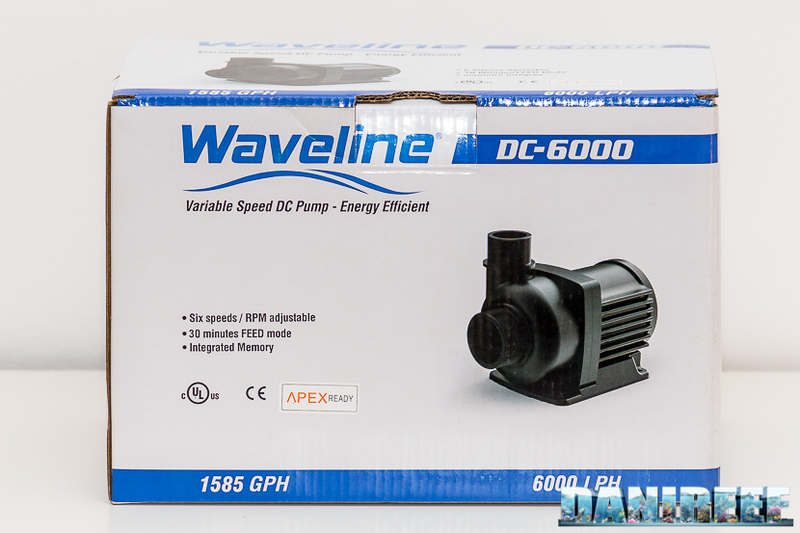 The reference value is useful to compare this pump with others. But even more interesting is the following chart where there are also the measured values of the other pumps, Eheim, Tunze,Sicce, Corallinea, that we have tested, ordered by the pump reference value: the product of flow rate and hydraulic head. 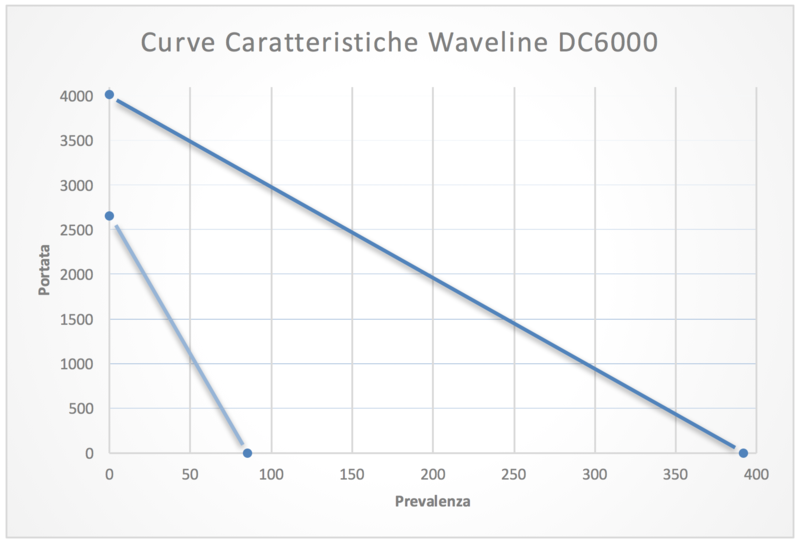 In this way we can have a meaningful comparison (the values in red of the Corallinea BQ5000 pump are estimated but not measured. They might not be perfect, but we believe they are sufficiently acceptable for our comparison). 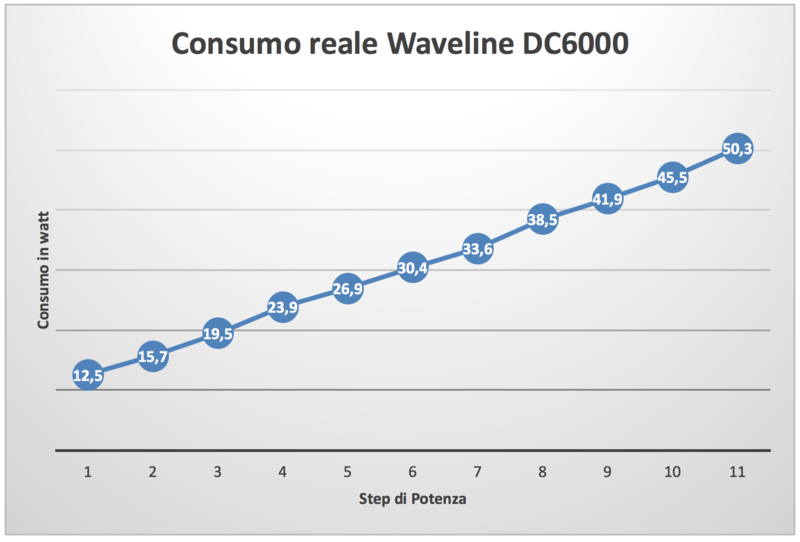 From the chart you can see that, from an economic point of view (that is the obtained range per each euro), the Corallinea pump is the best value. 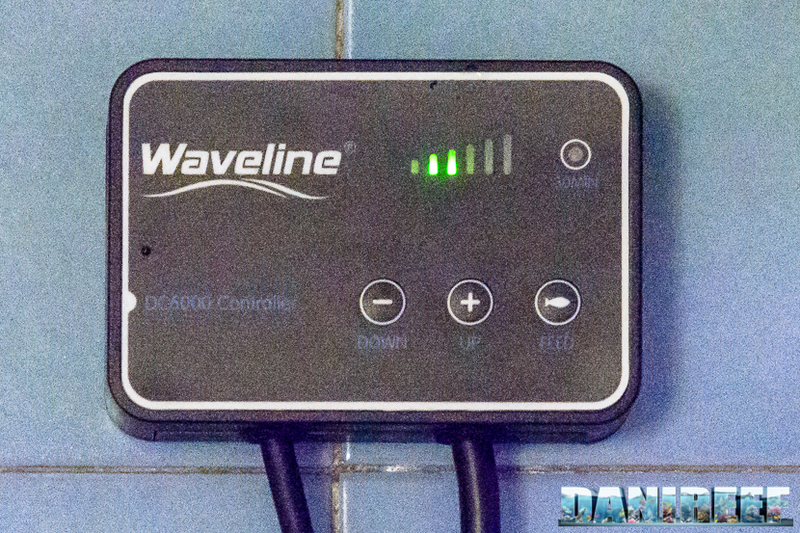 In regards to the range per watt, the best pump is the Waveline DC6000. 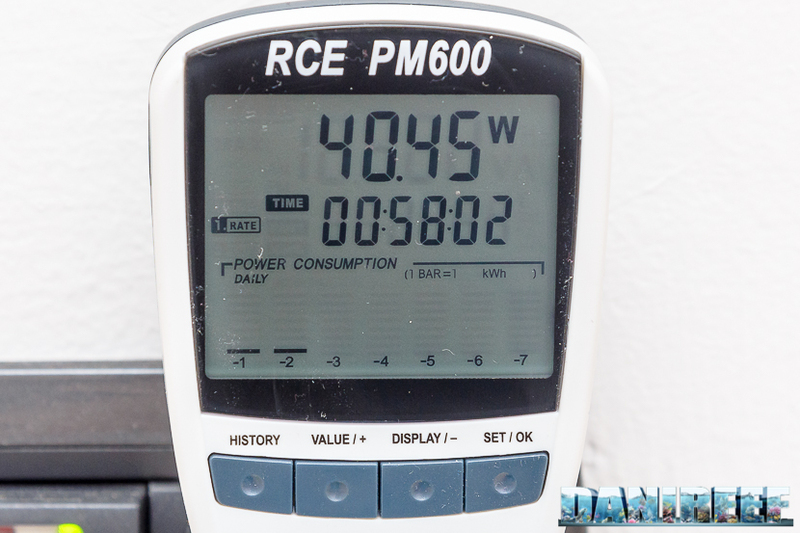 The energy consumption is almost exactly the same as the declared one. 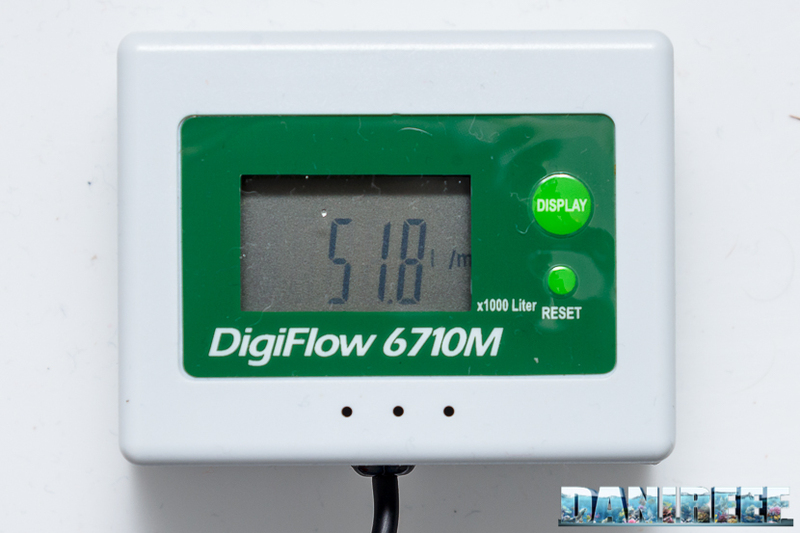 In the end we can calculate a value of the correspondence with the declared data for what concerns flow rate, head, and consumption. 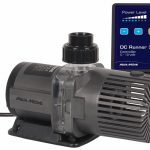 If you want to know if a certain pump suits you, you can read the article where we talk about choosing the correct return pump; you can also download our excel file and see if this pump guarantees that exchange aquarium-sump that you need. 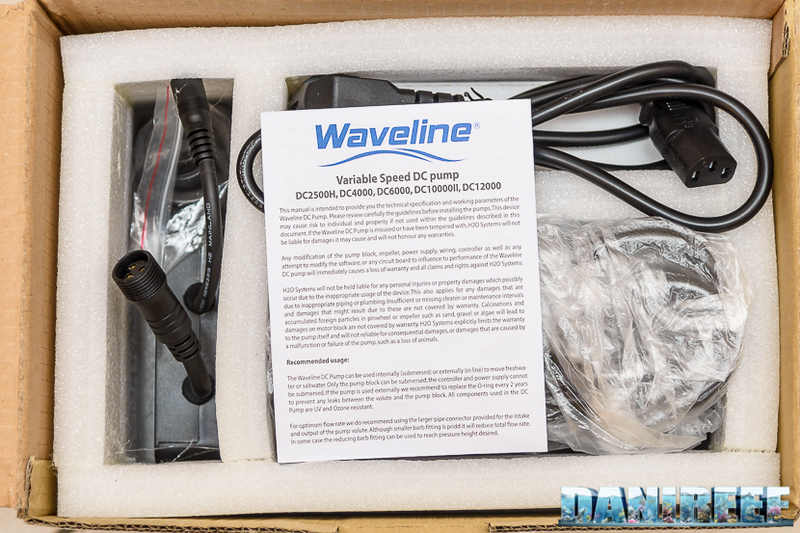 The reference value of the Waveline DC6000 at its maximum power is 1,571,136 l*cm/s, while the declared reference value for the comparison is 2,640,000. 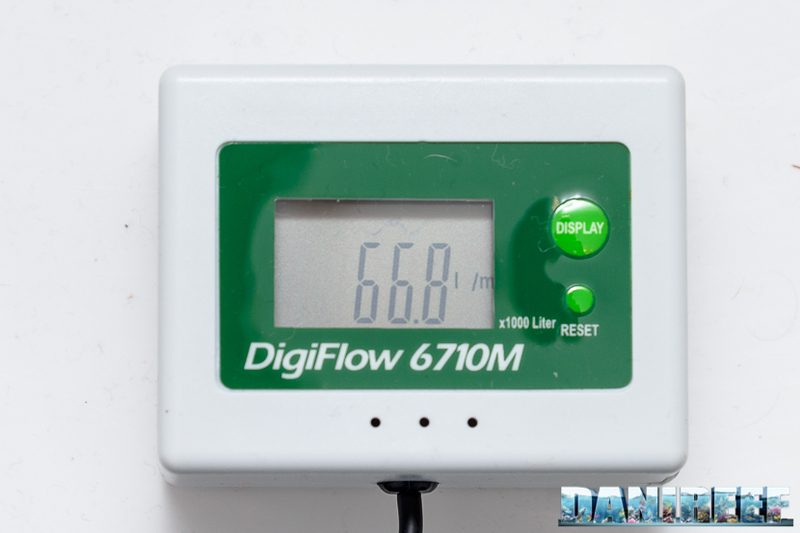 Remember that the reference value consists of the area between the values of head and flow rate, at their maximum values. It’s the product between flow rate and hydraulic head. There’s a sensible loss compared to the declared data, as we have just seen in the previous charts. But we have to consider the Waveline DC6000 pump in its real performances. 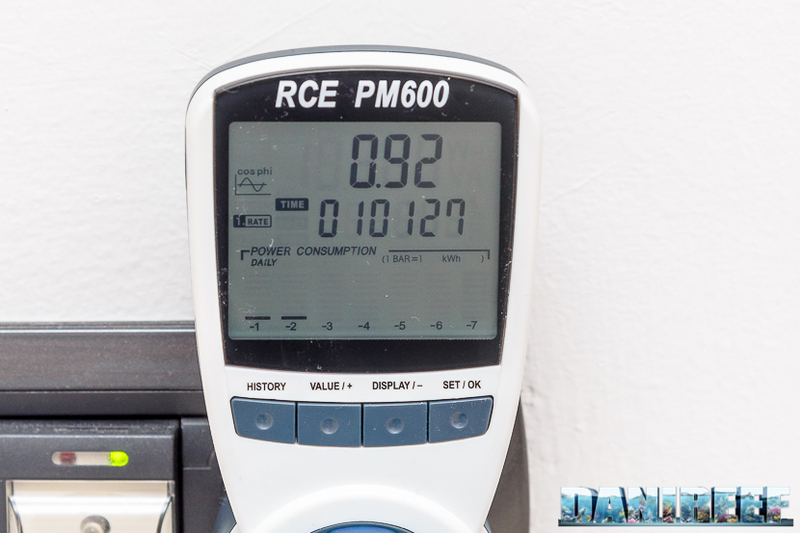 These values are in line with the competition (where the real values are quite far from the declared ones), an optimal technical efficiency (so a relationship between liters/watt very high) and a quite low consumption. 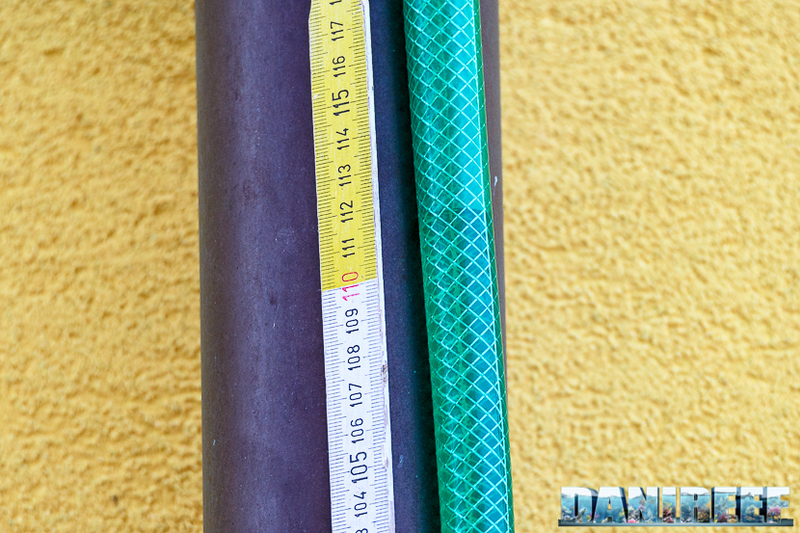 The price of the pump, 283 euro, isn’t cheap, but the low cost work could make it preferable to other solutions. 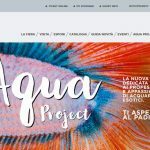 With 283 euro we have a electric pump at 24V, with 11 steps of incremental power to be programmed, with the possibility to be stopped in order to feed fish and corals, and with very noticeable results. 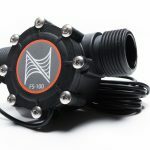 Moreover the pump is compatible with Apex computers, a resource of control that we wish would be implemented by everyone.